What’s in a Name? Who’d A Thunk It? All She Wants to do is Dance. It took nearly a week for Reggie to reach out to me. that’s how this story of my beloved Triton cockatoo is going to be told. Reggie and I both had a natural sense of rhythm and, when we both felt well, we loved to dance. Rock & roll was best, but any music with a predictable beat and exciting instrumentals got us going. I’d gyrate my hips; he’d flap his white wings while clinging to my forearm. We both tossed our heads and bounced. His saffron crest feathers and my blonde locks sprang to the beat. 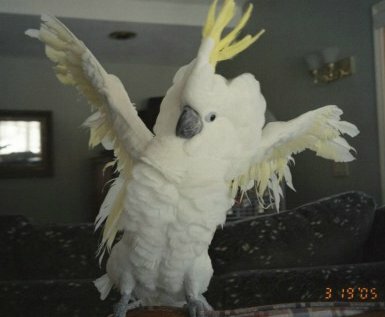 Every song ended with a bow, Reggie spreading his wings for a dramatic touch. Those were the good days when he was healthy. Toward the end, he’d cling to my arm while I did all the moving. Neither of us was interested in flapping. But moving still felt good. After he died, grief sunk deep within me, like the Titanic at the bottom of the frigid Atlantic. Knowing he was no longer suffering and feeling at peace about it were the warring factions inside me: wise head versus wounded heart. I asked for a sign that all was right wherever Reggie was. I got it. During a restless night I dreamt I was in a large hall at a party with music and dancing. Then, to my surprise, John Travolta entered with his entourage. I wasn’t going to miss an opportunity to meet him. I was 50—no time for shyness. Walking up to Mr. Travolta I said, “John, I fell in love with you and the way you danced in Saturday Night Fever.” Then I asked if dancing came naturally to him. He smiled a broad John-Travolta-smile. “Oh, it comes naturally. I bet you dance well, too. How about it?” He otioned to the dance floor with twinkling John-Travolta-eyes. He took my hand and guided through the crowed dance floor. The song was “All She Wants to Do Is Dance.” We stood face-to-face and began moving to the music. I closed my eyes and just moved to the music. I knew that John was doing the same. Our eyes were closed but we were synchronized and keenly aware of each other, moving as one. As the song was ending, we opened our eyes. We were alone on the dance floor, completing a well-choreographed dance, only we never practiced. We bowed; then we sashayed me off the dance floor as a kind of finale. Everyone applauded. I woke up with a start, still hearing the applause. In Michael, John Travolta plays an angel with big white wings. The symbolism in the dream was unmistakable: Reggie came back to dance with me and we will be moving in flawless rhythm forever in my heart. My grief lifted. I can dance to the tunes I used to play for Reggie, knowing I never dance alone. Thanks so much. It’s nice to know that the emotion I felt came through in my words. You feedback means a great deal to me as a new creative writer. Thanks for taking the time to read my blog and comment on this post! I’m sorry to hear about your girls. I’ve lost many dear pets and only write about them after they die (I guess because their story isn’t complete until then). I’m glad my story inspired you to write–it helps. Good luck with the blog, too. I’m finding it fun and helpful with my writing. Thanks for taking the time to read my blog and comment on this post! Thank you so much for sharing. I am still grieving over the loss of my two dogs – a year apart. I am just learning to blog and reading Reggie’s story has inspired me to do a tribute to my girls. Keeping writing. What a touching tribute to a faithful friend and, from the sounds of it, great dance companion. It’s a pleasure reading you! Thanks. These posts are a mix of my experiences and observations. Most are light-hearted, but some are just to-the-heart. I appreciate you empathy and comment. So sorry about your “Reggie” dying. I’m so glad that you had that dream and were able to have your spitis lifted.